Import. Import a text or comma separated file. JustNN can import a txt or a csv file to create a new Grid or to add new example rows to an existing Grid. 1. File > New to create a new Grid or File > Open to add rows to an existing Grid. 4. In the dialog check all the characters that are to be used for column delimiters. Line ends are used for row delimiters. 5. Any words before the first delimiter on each line can be used for row names. If no row names are available then JustNN can generate numbers for row names. Check the characters to use as Input/Output column delimiters. Set how to produce Example row names. 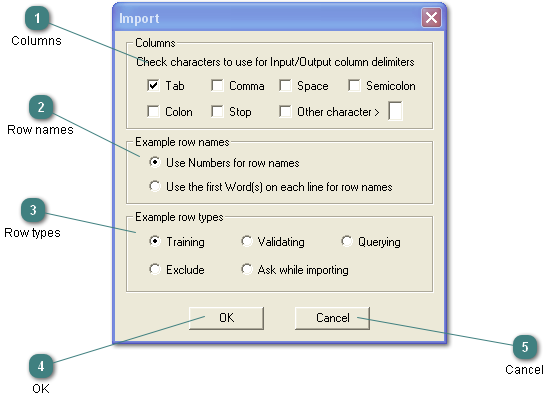 Set the example row type for all imported rows or ask for row types while importing.